There are few clubs at the top echelons of European football that can match Manchester United when it comes to the development of home grown young players. The legends of the club are there for all to see, after the Munich air disaster of 1958 which saw the vast majority of the squad lose their lives we saw the first group of young players come through in large numbers. They would become known as the Busby babes although few ever thought this class would be matched if not overtaken. That was until the class of ’92 emerged with players like Gary Neville, Paul Scholes and David Beckham amongst others. Look beyond these two famous groups though and throughout the years the first team squad has been littered by players that have been produced infused with the values of the club. Today there is still an emphasis on domestic young players at the United academy although this is combined with the modern trend for bringing young players from abroad in to your youth system. One of the most promising young players at the club today is the captain on the U-23 side Axel Tuanzebe. The youngster was born in the Democratic Republic of Congo although he has so far represented England at youth level and he has a playing style that should fit the first team setup under Mourinho like a glove. High praise then from a follower of the club who has seen Tuanzebe grow and develop. One of the aspects of a young defender’s game that tends to be last to develop is his positional awareness on the field in relation to his own teammates, the ball and his opponents. Tuanzebe displays an advanced grasp of the field as a whole and seems to understand not only where he should be positioned but also where his team are vulnerable. This ability to sense danger coupled with his physical abilities make him a fearsome proposition for the opposition. Here Tuanzebe is isolated centrally against a runner from Manchester City. The defensive structure as a whole is poor and City are able to identify and take advantage of the gaps in the United defensive line. As the ball is played down the channel we can see that Tuanzebe should be second favourite to win the ball given his body position and the angle of the pass. As play progresses though Tuanzebe comfortably outpaces the attacker in the tight area between the ball and the goal and is strong enough to shrug off the challenge and emerge in comfortable possession of the ball. On this occasion Manchester United were playing against Liverpool with Tuanzebe on the left of the defence. Once again he is isolated in a dangerous position in this game with an attacking player looking to make a run off of the defender’s shoulder and in to the space behind the defensive line. This time though Tuanzebe does not have to chase back to win the ball. Instead he quickly reads the danger and steps out to intercept the ball as it is played though in to the space. When he intercepts the ball in this fashion Tuanzebe is extremely effective in taking the ball out of the back or picking the most efficient pass to progress the ball up the field. Derby are in the wide areas looking to transition quickly from defence to attack via a counter attack. Tuanzebe is again in an isolated position just inside the opposition half. 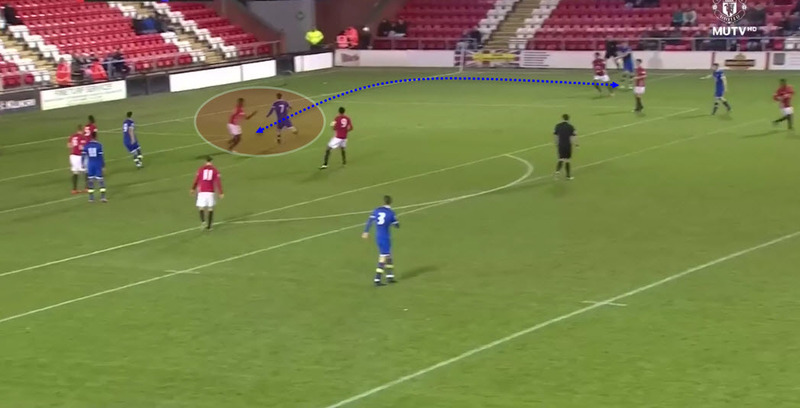 Tuanzebe positions himself correctly to prevent the man in possession from cutting back in to a central area where he would have a path to goal. As the attacking player looks to knock the ball past Tuanzebe along the line to outpace the centre back. Once again though we see Tuanzebe’s exceptional pace as he easily outpaces the attacker and comes away with the ball to start another attack. We have already seen that Tuenzebe defends the ball extremely well in space when isolated but he is equally effective in defending the six-yard box against balls that are played across the face of goal. Whilst the first section concentrated on his abilities through the lense of the modern game which is more expansive with more emphasis on building up from the defence the ability to defend the six-yard box is more of a traditional defensive skill. Here the ball is crossed over from the wide area towards the number seven for Wigan. The danger has come from a late run in to the near post area which Tuanzebe has read early and he is able to get across and in front of the Wigan attacker to challenge for and win the ball. If the young defender had been slower to read the ball or to get across to challenge for the ball then the opposition would have had an easy goal scoring opportunity. A similar story this time but on this occasion the ball is crossed over to the back post where the opposition have a player in space. Tuanzebe is equally comfortable defending on either side of the back four and here he is aware enough of his angles and the trajectory of the ball to ensure that he intercepts relatively easily and plays the ball comfortably out of defence. Axel Tuanzebe carries a genuine threat when in possession of the ball both with his capacity to pass the ball through lines in to advanced areas and his ability to drive forwards with the ball at his feet and commit defenders. He is a born leader who has captained every age group at United as he moves through the ranks and this shows with his ability to dictate the tempo of the game from the defensive line. In this example Tuanzebe has driven forwards with the ball from deep inside his own half. He has committed and beaten three opposition players and when he enters the final third he displays his composure on the ball. He pauses in possession at this moment and waits for his teammate to make a run in to open space beyond the defensive player. This slight hesitation on the ball is enough for the attacker to gain separation and to be in position to pick up the ball without being challenged. This time I have captured an image with Tuanzebe in possession of the ball in his own half. The path ahead of the defender is crowded both with opposition players and with his own teammates. Along with three supporting players we see a diamond structure which gives Tuanzebe easy passing options to progress the ball up the pitch. Instead he chooses to bypass these options by playing a vertical pass through the opposition lines to a teammate in an advanced position. As a coach Jose Mourinho is notorious for being reticent to put his faith in younger players. That said it may be difficult to ignore the progress of Tuanzebe as he continues to perform in a manner that makes it clear that he is head and shoulders above his peers. Tuanzebe has a large amount of support amongst the internal coaching staff at various age groups and it is likely that they will continually remind Mourinho about his progress. He is a rare mix of the new and the old in terms of defending styles and appears ready made for the rigours of the English game. It looks as though it is only a matter of time before the club has another illustrious graduate to add to the ranks.